Sally Brampton and Virginia Woolf. When I first saw Sally Brampton’s name trending on twitter today I felt that shudder that prequels bad news. And sure enough, she has left us. Before I knew how, I thought of Virginia Woolf. This is an excerpt from Virginia Woolf’s suicide note to her husband. So, it is not simply about being unhappy. I knew I had one of Sally Brampton’s books in my library. I could even picture the cover in my mind. Unprepossessing but memorable all the same and hence it was easy to find amongst those gathering a little dust in my garage. 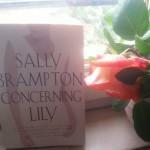 Concerning Lily was published in 1998 and I probably read it soon after. I am not going to pretend I fully recall the story but I do remember the feeling that the title evokes. Unexplained melancholy. So here I am some eighteen years later. I open the first page I wonder if there are any clues to the future? Chapter One starts like this. Probably even more telling and from experience absolutely typical of the 1980s. Sally Brampton had been receiving professional help and support from her family. How hard it must be for them. And how hard it is for us mere mortals to accept that maybe there was nothing more we could have done. Most of us find that the hardest feeling of all. (A line from Alfred Lord Tennyson’s poem, “In Memoriam A. H. H.”) Tom: I’ve been so miserable since Nancy and I broke up. I wish I’d never met her. Fred: Come on, now—’tis better to have loved and lost than never to have loved at all. I still wonder sometimes about this quote. With love to anyone dealing with such tragic loss.